At the end of August, Tony traveled to his home state of Wisconsin for the official unveiling of the Milwaukee Bucks Art Collection at the newly constructed Fiserv Forum. His mural Eras was selected from over 1,200 entries last year. Thirty-two artists are featured in this collection, twenty-two with ties to Wisconsin, while more than one hundred students also contributed work. The ceremony was a celebration of the value of art and demonstrated how art can be integrated into a very large, multi-use space. The art and its artists were not mere afterthoughts to fill space. The art is a dynamic part of design and architecture of the arena. It is truly something to marvel at. 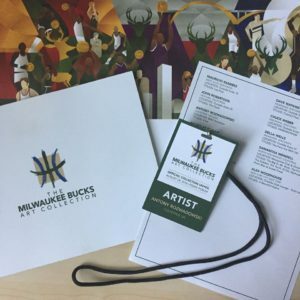 Tony would like to thank Sports & The Arts for curating and guiding the collection along with the Milwaukee Bucks for a memorable weekend. It is an honor for Tony to be included in this diverse and beautiful collaboration of artists from Wisconsin and beyond. For more photos from Tony’s trip, visit his photo gallery on the K Art Facebook page. 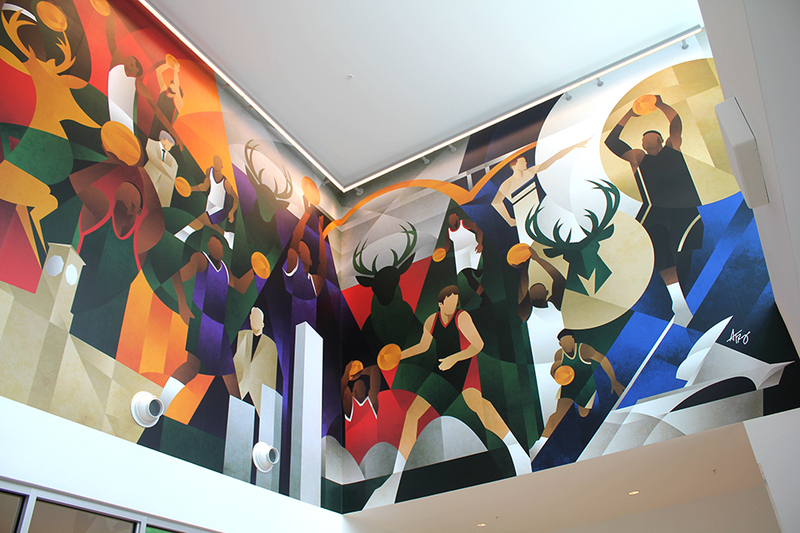 Eras depicts the history of the Milwaukee Bucks through their significant players, coaches, logos, and uniform color schemes while incorporating several Milwaukee landmarks. It encompasses both Tony’s fandom for the Bucks and his love for his birth city, where several Rozwadowski generations still reside. Originally conceived as a quadriptych that could either be used as wall art or a mural, Eras evolved into one seamless design split into two images for the wall space selected for display. Eras starts with the original Bango Buck logo and color scheme from the early years of the franchise into the 1980s. Historic players and coaches are present alongside the Allen Bradley Clock Tower as it leads to the first major redesign of the Bucks logo. The purple, green, and silver color scheme is shown prominently with the forward facing buck and triangle crest logo of the 1990s. “The Big Three” era includes the U.S. Bank Center building and Milwaukee skyline along the bottom. Purple gives way to a callback of the classic red used decades earlier. Two more landmarks, the Mitchell Park Conservatory (The Domes) and the Daniel Hoan Memorial Bridge, complement the buck crest logo into the mid 2000s to 2010s. The bridge spans across the design to connect the past to the future. Eras ends with the third major logo redesign and color scheme change for the franchise. The new modern buck head/M combination introduces Cream City Cream, Great Lakes Blue, and black to the familiar green. The team’s current stars surround the logo and beautiful Quadracci Pavilion, ushering in a new era of promise for the franchise, its fans, and the city’s revitalized downtown. Eras is a digital illustration that was installed to the interior walls of the Fiserv Forum’s BMO VIP Entrance way using a vinyl application. Even though it looks like it is painted like a traditional mural, it is not. Tony emulated a painterly style with the addition of textures and shading to capture the appearance of a traditionally painted mural. Can you name all of the players in Eras that have worn a Bucks uniform? Recognize the Milwaukee landmarks?